Popperola and Ampere Present: TEEN, 27 February 2016, with Pirrès (B. ), Raoul Belmans (B. ), Luke Solomon (UK) and Brett Johnson (US). The ideal birthday should be a joyous communal celebration of the fact that you’re fully alive. But what if you were born on a day that doesn’t happen on a yearly basis, but only every four years? Well, that just means you have to party super hard – an extra 150 percent at least! Dr. Poppers (né Tom Nys), curator and writer about dance music and contemporary art, happens to have his birthday on that notorious leap day 29 February. This year he turns forty, which in leap years means he turns ten, effectively becoming a teenager! 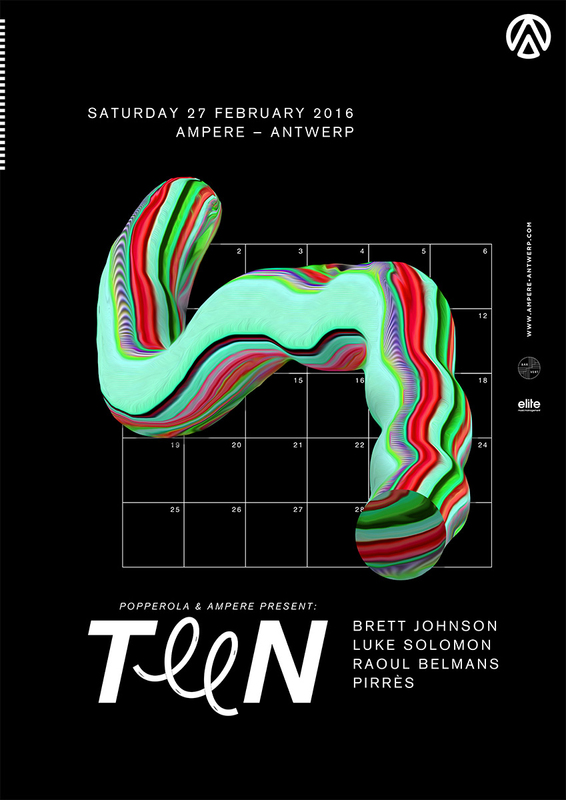 For this momentous occasion, Poppers teamed up with Ampere, a relatively new club in Antwerp already voted second in Red Bull Electropedia’s Music Awards for the category “Best Club”in its first year of existence . Together they plan to put on a most memorable tenth birthday party – and everybody’s invited to join the festivities. Poppers is certainly no stranger to the Belgian party scene. He was a member of the infamous Oase de Pleasure collective in his hometown Leuven who programmed djs such as Koenie, Smos & Baby Bee, Aphrodite Terra (FR), Timmy Richardson (US), Elliot Eastwick (UK) and Keb Darge (UK). Later he organised his own Popperola parties featuring the likes of Crispin J. Glover (UK) and Stefan Goldmann (DL). All of the artists mentioned above deal in the deep and funky house which holds a special place in Poppers’ heart, and this is exactly the music that will fuel TEEN – along with that sweet house party vibe to match. The evening will kick off with Ampère resident Pirrès, a sure bet to get the partygoers started on the dance floor. Next up is Raoul Belmans; a long-time friend (and neighbor) of Dr. Poppers. Raoul is also a highly respected veteran of the Belgian funky house scene with considerable international renown. He was a resident at the legendary Food club nights, label owner of the seminal house label Aroma, former dj at Belgian national radio Studio Brussel and one half of the producers duo Swirl People. This is most definitely the man to bring the party to the next level! We should have a good vibe going by the time Londoner Luke Solomon dives in. Luke is another longtime deep house mainstay: resident at Bar Rumba in London, co-founder of Classic Music (truly a well deserved name) along with Derrick Carter. and Music For Freaks with Justin Harris. Justin and Luke also formed the core of the musical project Freaks, whose “Where Were You When The Lights Went Out” became a dancefloor hit. Recently Luke is also involved in Powerdance, a new live project featuring several interesting figures in today’s dance scene. Last but not least we present Brett Johnson, who has his roots in the lone star state Texas but now lives in the German capital. His quirky and boompty productions were rapidly picked up by Classic Music. His own label Easoteric built up a respectable catalogue, and presently Brett has regular releases on high-profile labels such as Cynosure, Visionquest, Get Physical, Legwork and Bang The Box (the imprint he ran with Lance De Sardi). Apart from all that, Brett is an excellent and highly skilled dj as well as an extremely lovable guy. Club Ampere is guaranteed to be the ideal club for this stellar line-up, offering a superb sound system, great facilities and a top-notch staff. It should be clear that TEEN will make a legendary night out, as well as a birthday well celebrated! ← National awareness campaign about abortion stigma (in relation to the 25th anniversary of the Belgian abortion law): the final result.